(MetLife Stadium) The NY Jets held their annual Green & White scrimmage at MetLife Stadium. A great turnout for this event. Imagine if you were a fan that couldn’t afford the seats in the lower bowl of the stadium. Today was your chance to bring out the family to experience your favor players up close. The Jets are in a rebuild season. Most of the players on the offensive side of the ball are rookies or second year players. Coach Todd Bowles spoke to the media after the scrimmage. His main concern was how the offense was able to move the ball down the field. Bryce Petty was give the start with the first team. Petty performance was at best average, but is confidence is high. He appears to have the leadership qualities to run a team. Jets defensive front will be key to stopping the Raiders two headed monster rushing attack. On the defensive side of the ball the Jets are a well oiled machine. 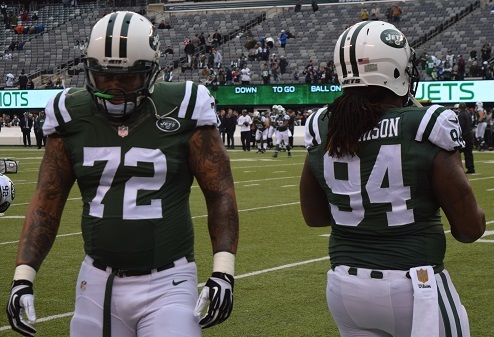 Lenard Williams along with Sheldon Richardson are the leaders of defense team. With some added additions through the draft the defense should rank in the top ten in the NFL .